So said modernist architect Le Corbusier. Or maybe it was his contemporary Mies Van Der Rohe. Or was it 19th-century author Gustave Flaubert? Whoever said it first, it remains the case about residential design. That's why the judges of the Washingtonian Residential Design Awards paid attention to the finer points: the curve of a hanging staircase, the glint of a brushed-aluminum sink, a fireplace in a wall of glass. *****This year's judges were Natalye Appel, who heads her own firm in Houston; Kenneth Hobgood, who does the same in Raleigh, North Carolina, and teaches at North Carolina State University; and Charles Davock Warren, whose eponymous New York City firm does commercial and residential architecture as well as garden, interior, and furniture design. *****The 2004 competition, which drew 98 entries, was open to registered architects of Washington-area homes or second homes owned by local residents. Entrants' names were unknown to the jury until winners were chosen. The Washingtonian Residential Design Awards are sponsored by the Washington chapter of the American Institute of Architects and The Washingtonian. People in Glen Echo like to see their woods. This homeowner made sure of it with architect Robert M. Gurney's contemporary design: lots of glass, especially in the living/dining area, which extends dramatically into the landscape. On an existing foundation, a new house took shape–an elliptical entry section, clad in lead-coated copper, with a vertical slot window; an angular glass living area with a terrace built into the hill outside; and a rectangular mahogany section enclosing private areas. Inside, mahogany cabinets and Brazilian cherry floors are set against lighter maple and ash, while oxidized steel, aluminum, and concrete contrast with stainless steel, glass, and Venetian plaster. "I like that you sense you're part of the landscape," one judge said. "This design could be a disaster in the wrong hands . . . but instead it's straightforward, simple, and strong–beautiful." The contractor was M.T. Puskar Construction Company of Alexandria. If this house were any closer to the edge of the cliff it's perched on in Shepherdstown, West Virginia, it would no longer be onthe edge. Its three parts–guesthouse, main house, and study–are connected by bridges, one inside and one that doubles as an entry and screened porch. Each part has its own foundation, allowing the house to touch the ground only minimally and heightening theeffect of a string of rural buildings. The narrow footprint and floor-length windows also reduce the sense of the house's imposingon the land. Upon approach,you have the illusion of heading straight through the house to the ridge. "Great strategy for the site," said the judges of Mark McInturff's design. "Straightforward simplicity with traditionalmaterials." The contractor was Evergreen Homes of Shepherdstown, West Virginia. "You want to see this from adistance," the judges agreed. "That's where it has its real power–theseriality of the forms contrasts with the landscape in a way that feels right with its environment." The house is nice up close, too.Inspired by clustered white farm structures typical of the Eastern Shore, this weekend getaway is built around a courtyard. The three main structures are for living, dining, and sleeping; the fourth section, a guesthouse, is above the carport for extra privacy. The curve of the connected structures approximates the nearby shoreline. Every indoor space has a viewof water and meadows; the deck extends toward the bay for additional outdoor living. Sorg andAssociates' interplay of geometric forms connects functionality, local architecture, and the natural landscape. "So appealing . . . pure simplicity of concept," said the judges. The contractor was Coleman-Meredith Construction of Easton, Maryland. "This is a case ofrestraint in what was taken out and what was put back," said an appreciative judge. "And not that much was put back," added another, "but there's a whole city's worth of detail there." The 1870 Federal-style rowhouse was remodeled in the 1990s as a one-floor flat. 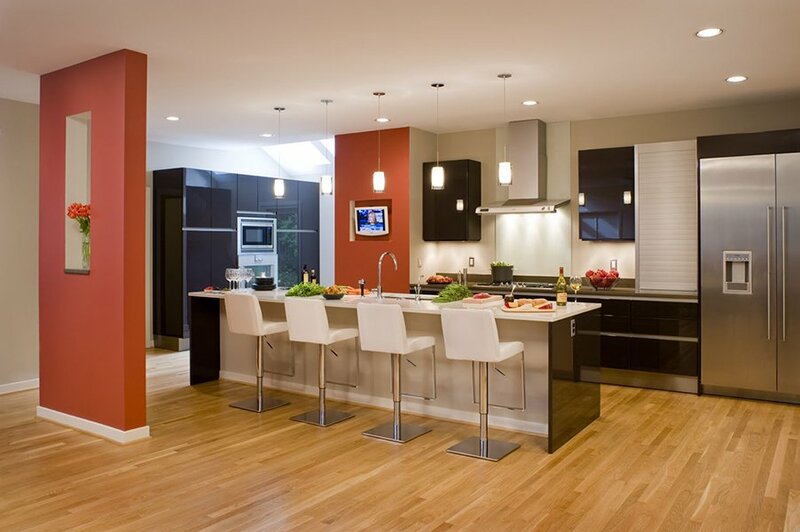 Much of the space was taken by oversize kitchen cabinets and wall partitions. The current owners wanted clean lines and an open floor plan. Enter the DC architectural firm Scout Motor Company. The architectsremoved the kitchen and put in a sleek new sink, oven/cooktop,dishwasher, and fridge, all connected by a thin brushed-aluminum shelf that doesn't touch the wall. The same philosophy was taken into the bathroom, behind the kitchen wall. "A small place for a couple with small needs," noted the judges–and who appreciate "really high-tech detail." A new English country house, low and rambling like a Cotswold cottage? 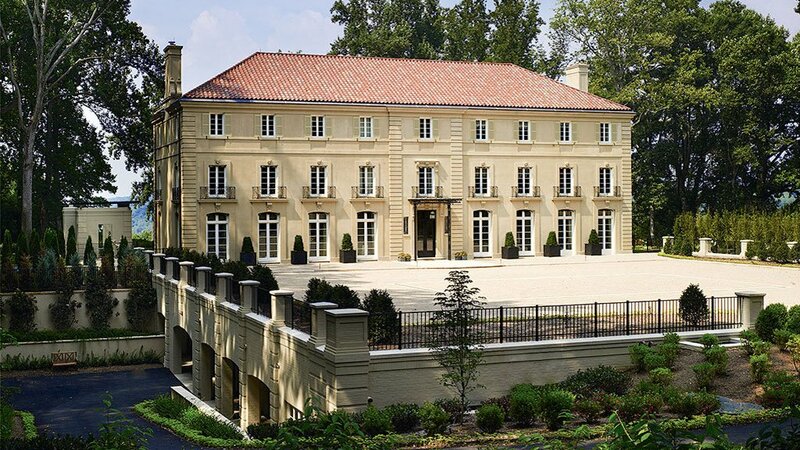 It fits right in among the wooded estate homes of McLean. Versaci Neumann & Partners hadto fit a lot onto a sloping site: a first-floor master-bedroom suite, a library big enough for a piano, an ample kitchen/family room, a dining room, three children's rooms, two home offices, and a garage with guest quarters. Their plan follows the form of a Greek cross, with the master suite across the top, and the porch, family room, and walkway to the garage making up the center beam. English examples inspired exterior details: steep slate roofs, fieldstone walls, hand-hewn oak posts and beams, cathedral windows. Extending from the master bedroom, family room, and porch, the fieldstone theme of the vestibules continues along a lengthy terrace to the pool and poolhouse. "It's all incredibly well integrated and handsome," said one judge. "Designed to have many rooms that have multiple exposures to the outside without becoming an ungainly mass . . . this will stand the test of time." The contractor was Horizon Builders of Crofton. Like popping the cork on a bottle of Champagne–that's the effect pulling out a central fireplace and chimney had on this French-style "cottage" in DC's Woodley Park. Once that central plug was removed and replaced with stairwells and natural light, the house gained a wonderfully open feel. Barnes Vanze Architects opened the downstairs foyer to shift traffic toward the kitchen and living areas and away from a narrower bedroom hallway. Other changes redirected access to bedrooms and other private areas on the main floor and gave two other levels better views of the forested ravine behind. The master suite got enlarged window walls, and the upper level was expanded to include an office and terrace. "It's ingenious the way the chimney was taken out," said one judge–"such a small gesture but such a major impact on the house. You move through the center of the plan now instead of moving around it, where it was blocked." The contractor was Linn Company of Oakton. Problem: The clients' second home, a 1930s moderne villa in Virginia's Northern Neck, had no space for weekend guests. Solution: architect Mark McInturff's guesthouse, joined to the main house by a kitchen and informal eating and sitting areas. A terrace takes in Rappahannock River views and supports the framed-steel tower of screened porch and guest rooms. The jury noted the addition's "incredible light" and its "precisely detailed, carefully constructed parts," saying, "It's so clear that this architect really cares about detail and how things go together. The tower is nice punctuation to the existing house." The contractor was Murray Bonitt of Alexandria. "Here," said the jury, "we have an ordinary little house made into a jewel, inside and out." The two-bedroom North Arlington rambler was no match for its Craftsman neighbors. The owners asked Moore Architects to double the home's square footage, adding a second floor and reorganizing the first, while sticking to a tight budget that meant reusing arecent kitchen addition andreplacement windows. The front wall was moved out three feet and a six-foot-deep porch added. The old living room became the inglenook and foyer; the front bedroom became a living room. Upstairs, a new master bedroom fills the entire front dormer; a study and walk-in closet are tucked under the eaves. From Craftsman trim inside to timber outriggers outside, "this transformation was incredibly skillfully done," said thejury. "Simply and gracefully achieved, it sits on the street better than it did before." The contractor was GN Contracting of Arlington.